For the first time in years, Apple's iPhones weren't the star of the show. Apple unveiled a smartwatch on Tuesday. It's a wearable device that marks the company's first major entry in a new product category since the iPad's came out in 2010. The move is significant because of questions about whether Apple still has a knack for innovating. The smartwatch's introduction upstaged the company's two new, larger iPhones. 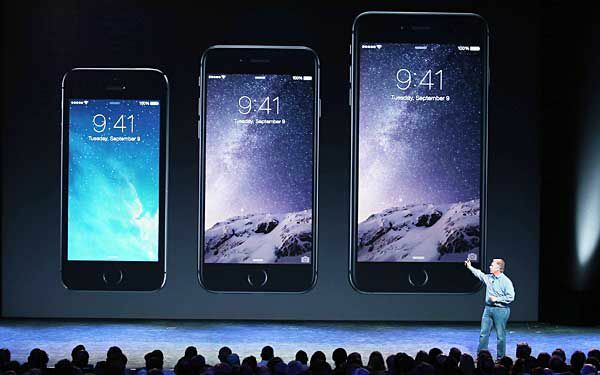 The iPhone 6 will have a screen measuring 4.7 inches, while the iPhone 6 Plus will be 5.5. In both cases, developers will design apps that can be viewed differently when the phone is held horizontally. Apple also introduced a system for using the phone to make credit card payments at retail stores. There was another unveiling, too, at the big Apple event. U2 just put out a new album, and all customers with iTunes accounts could download the 11-song "Songs of Innocence" for free Tuesday afternoon. Apple said the album will be released to everyone else Oct. 14. The iPhones still are the product that makes the most profit for Apple. The larger models should help the company compete with Android devices, such as ones made by Samsung. The iPhone 6 will have a 4.7-inch screen, while the iPhone 6 Plus will be 5.5 inches. The screen resolution on the Plus version will be sharper than previous iPhones, at 401 pixels per inch rather than 326. The new phones aren't as big as Samsung's latest flagship phones 5.1 inches for the Galaxy S5 and 5.7 inches for the Note 4. Notably, Samsung's Note phone isn't getting bigger this year. Last year's Note 3 was 5.7 inches. Instead, Samsung is emphasizing features such as a sharper screen. It's also releasing a model with a curved edge to display weather, time and other information on the side of the phone. Apple says its new phones will be faster and have better battery life than previous versions. It also is improving a slow-motion video feature by allowing even slower shots. The new phones will start shipping in the U.S. on Sept. 19. Advance orders will begin Friday. The price will be $199 with a two-year contract for the iPhone 6 with 16 gigabytes of storage. However, the step-up models will have double the memory than before. They will cost $299 for 64 gigabytes and $399 for 128 gigabytes. The iPhone 6 Plus phones will cost $100 more at each configuration. You'll be able to use your phone's camera to capture a photo of your card. Apple will verify it behind the scenes and add it to your phone's Passbook account so you can make payments at a retailer. Many companies have tried to push mobile payment services, but none has caught on widely. It's called the Apple Watch, rather than the iWatch that many people had been speculating. Consumer electronics companies have yet to demonstrate a compelling need for smartwatches. Bracelets have largely been niche products aimed at tracking fitness activities. Apple's device looks to change that. Much of the interaction would be through the dial on the watch, which Apple calls the digital crown. The new watch will come in a variety of styles and straps, with a choice of two sizes. Watches from competing vendors have been criticized for being too big for smaller arms. Among other things, iOS 8 will let devices work better in sync. For instance, it'll be possible to start a message on an iPhone and finish it on an iPad. These handoff features will extend to the new Apple Watch, too. 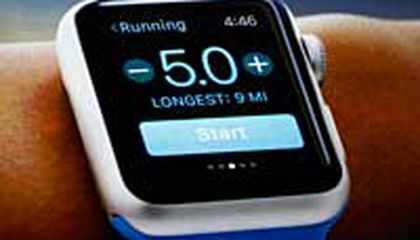 Critical thinking challenge: Despite the popularity of the iPhone, why did the author think the Apple Watch was the star of the show? It's a nice looking phone, but in all reality it's an over glorified iPhone 5s. I mean all they really added to the phones were a thinner and bigger design, while other phone get 2-3 Gb of ram, open sources, water proofing, durable screens, and wireless charging. In all reality the iPhone looks nice but is inferior to most other next generation phones on the market. The author thought the apple watch was the "star of the show" because it had been anticipated since 2010. And many people have been waiting for its release since its announcement. It is the star of the show because people have wanted something more than a exercise watch. Or a Step Counter. They want something that they can use as a phone without having to carry it around in their hands all the time. Despite the popularity of the iPhone, the author thinks that the Apple Watch was the "star of the show" because the fact that it is new and apple is still innovating new products, everyone will love this. This will be the next big thing and people will start to love it. There not bracelets or boring watch's, its new and improved smart watch, iWatch. I feel like the author thought of the Apple Watch as "the star of the show" because it was Apple's first new product since the iPad. Also people thought that Apple has lost their ability to be "innovative" over the years, this can just prove that Apple can still be the same company they've been since 1975. The apple watch was the "star of the show" because this was the "company's first major entry in a new product category since the ipad in 2010". I think the author thought the Apple Watch was the "star of the show" because Apple hasn't made watches before, only phones and tablets. So making a watch is something new for them and is gaining popularity. dude that is so cool i hope it comes out soon. And i hope ios 8 will also come out. now the new iphone is like an ipad mini already. This is really cool. After one year from the iOS 7's big impact on society now we have the iOS 8! Also, Apple is releasing 2 new iPhones that will compete with android phones tremendously. With the iPhone 6 they put a 4.7 inch screen and the 6+ with a 5.5 inch screen. The pixels on the iPones new screen has almost 80 more pixels per inch which will make pictures out more clearer and applications be more HD. Also, Apple is coming out with another new product: the smart watch. Although there are many different smart watches around this new look is stylish and looks very cool. This update for apple and all its products will make a huge impact on society and apple products forever.